A cake or sweet bread baked in sizes large enough to accomodate multiple servings - usually served with coffee. 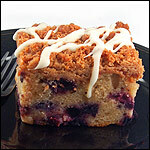 Commonly served for breakfast or brunch, coffee cakes are usually, but not always, sweet in nature. The editorial content above may not be reproduced without the written permission of Mr Breakfast.com. Please contact us for reprint requests. "Great Breakfasts" Start With The Letter "C"